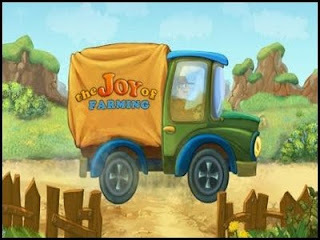 Carrots, potatoes, tomatoes and more await your magic touch in The Joy of Farming! Help Joy turn a shabby homestead into the Farm of the Year by growing a variety of mouthwatering vegetables and turning them into the products her customers want. The Joy of Farming uses a side-view perspective, which adds the challenge of equipping your farm with ropes and ladders so your workers can fetch water and take their harvest to the storehouse. While you're keeping your crew busy, you'll also have to stock your roadside stand and watch out for thieves! As you catch your breath between stages, you can upgrade your farm and purchase the plans to build ever-more elaborate production facilities. With its unique perspective, charming graphics, and challenging tasks, The Joy of Farming is as refreshing as a summer's breeze.